Toronto Sweat Clinic - Illusive Design Inc. The Toronto Sweat Clinic was founded in 2008 to help those suffering from excessive sweating. 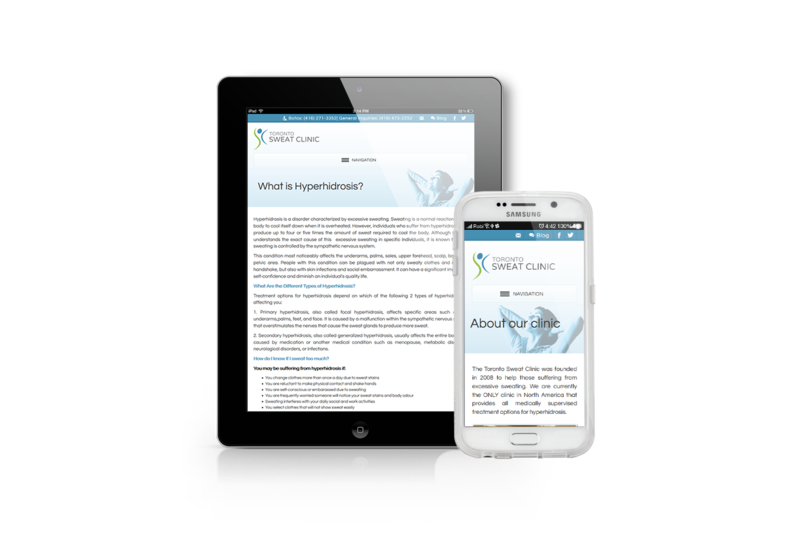 They are currently the ONLY clinic in North America that provides all medically supervised treatment options for hyperhidrosis. The Toronto Sweat Clinic specializes in the treatment of excessive sweating through personal, medical consultations, offering services such as MiraDry, ETS, and Botox. 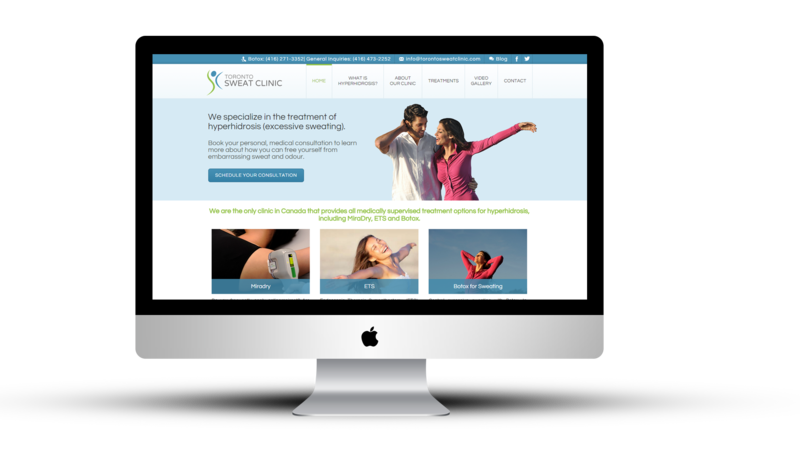 Through a fully-featured mobile responsive WordPress website design, Illusive Design achieved an accurate online representation for the Toronto-based clinic. The successful deployment of content within an aesthetically pleasing design resulted in a finished product that all parties could be satisfied with. This corporate-based website has facilitated more business opportunities for the owners and will continue to do so far into the future. There has never been a time where having a mobile responsive site was more important than it is today. Many customers are not going to be browsing through a laptop. The majority of the population uses their smartphones now to look up relevant services in real-time and, in order to keep the audience on your site, one needs to have a site that is capable of operating in a mobile environment. Through the employment of effective coding, the Toronto Sweat Clinic is easily adaptable into a mobile platform. Every industry comes with its own features that, if used effectively, can result in a dramatic increase in the amount of time one spends on your website. The health industry is no different. The Toronto Sweat Clinic website design comes complete with a schedule consultation appointment form to allow visitors to make an appointment in real-time, a main page banner design incorporating the use of video to capture a visitor’s attention instantly, and a video gallery that helps better communicate the company’s vision. 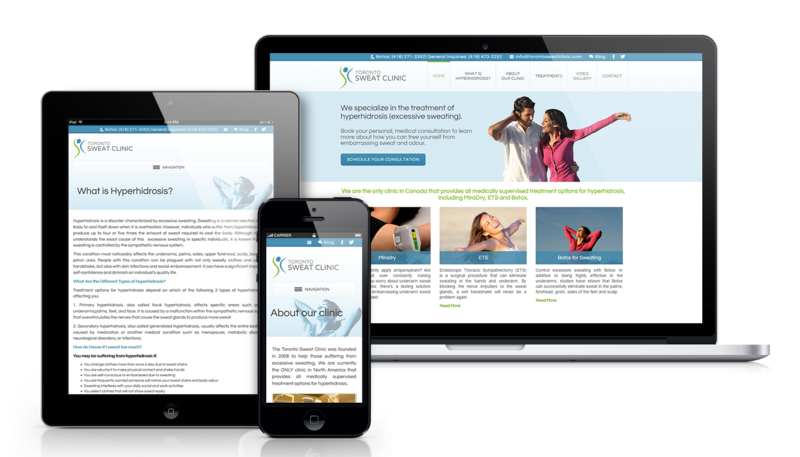 Illusive Design’s open, honest, and authentic approach to search engine optimization was based around a long-term strategy to grow the Toronto Sweat Clinic’s audience base. Through a site that was now optimized for mobile platforms as well, the easy-to-navigate WordPress custom build saw the company achieve a site that facilitated new business opportunities for its health industry-based business. The Toronto Sweat Clinic’s message to their audience base is effectively delivered at every page and every click. A business’ message to their customer must be one that instantly engages them and that drives them towards an action. The video gallery and schedule consultation appointment form assist in accomplishing this. Illusive Design was able to craft captivating content, emphasizing it right, and thereby allowing for the company to acquire a better return on investment than they ever had before.